Peter Kenson was born in Bristol, UK and grew up in an era when computers were new, exciting and the chairman of IBM forecast that there was a world market for maybe five computers. He graduated in Mathematics with a Masters in Operational Research and spent the next forty years working in IT at all levels from programmer to IT director. He has always enjoyed reading, particularly science fiction and fantasy and wrote his first book, Sertian Princess, commuting on a train in and out of London. The family loved the story and eventually bullied him into taking the plunge and publishing it. 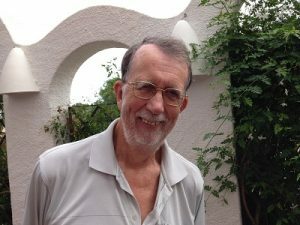 After a writing gap of many years, Peter now lives in Spain with his wife Diana, where he has rediscovered his passion for creating new worlds for his stories. The climate, relaxed way of life and the odd glass of wine probably help. When I was younger, I was fascinated by the worlds that some authors like Anne McCaffrey seemed able to create. They were detailed, they were internally consistent and they were populated by relatable characters displaying the whole range of human emotions, abilities and failings. That is what I try to do with my own stories. I love creating a new world, filling in the background detail and then blending the principal characters into that background. I am currently writing the third book of a trilogy. The first book I wrote totally by the seat of my pants. The second book I did a small amount of outlining because there were sub-plots arising from the first book that had to be kept under control. This third book, I am doing a serious amount of outlining because of the number of sub-plots that have to be brought together in order to bring the book (and the trilogy) to a satisfactory conclusion. I suppose I listen to my characters. I try to put myself into their position particularly in dialogues. How would they react to what has just been said? What would they reply and how would they say it? How would their feelings affect the language they use and the actions they take? It requires a lot of changing hats during this process and a significant dialogue will often go through multiple revisions before I am happy with it. Finish the story! Don’t get so bogged down in editing or improving the work as you go along, that the story never gets finished. Everything can be improved and polished but a highly polished half story is still only that: half a story. I think the decision to self-publish was made for me by my two sons who are both far more technically literate than I will ever be. They bullied me into self-publishing the first book and, to my amazement, people starting buying it. Looking back on it now, they were quite right because my books have now been read (and hopefully enjoyed) by thousands of people who would not have had that opportunity if I was still waiting for an agent or a traditional publisher to accept them. I think both forms of publishing will continue to exist. I think the percentage of books published in the different formats will continue to change but traditional publishing will survive because many people still prefer to hold a printed book in their hands.